As Kobe Bryant's legendary career comes to a close, his maniacal intensity and undying love for the game are celebrated with the 'Black Mamba' Pack presented by Nike Basketball and Nike Sportswear. 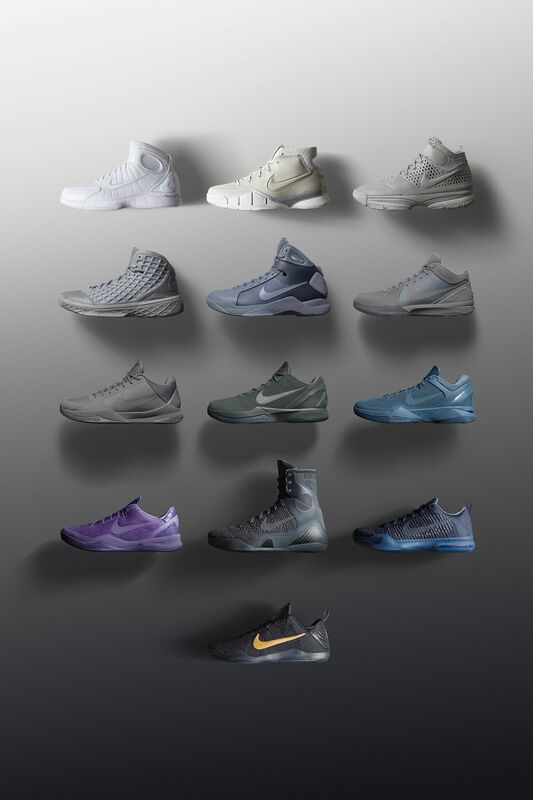 The limited edition collection features thirteen sneakers that tell the story of Kobe's evolution via city-inspired signatures, beginning with the Air Zoom Huarache 2K4 and Rieti, Italy, and ending with Los Angeles and a special edition of the Kobe 11. Each sneaker in the 'Black Mamba' Pack relates to a destination that has shaped Kobe's Mamba Mentality and uncompromising approach, while also tying in to key career achievements, from championships won to gold medals earned. The pack's limited edition styles, which slowly fade from white to black as an appropriate metaphor heading into Bryant's final game, will drop in sequence leading up to 13 April.